Graph above shows how FoxUV LEDs virtually eliminate wasted energy in the undesired and sometimes counterproductive/dangerous wavelengths. The 360-365nm range is a very desirable wavelengths because it falls along the i-line of mercury. It also happens to be the wavelength at which various naturally occurring photobiological and photochemical reactions take place. Mercury bulbs however besides having mercury as a toxic substance also emits in a number of other wavelengths, thus lowering the efficiency of an overall system. Some applications even require filters and thermal barriers to deal with the IR and non 360-365nm wavelengths. 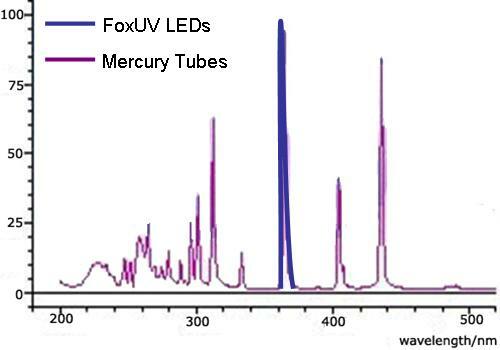 FoxUV LEDs emit a narrow band focused on the i-line of mercury. There is no lost radiation requiring filters and no IR in the light. Some of the main applications for this wavelength range are Medical, Germicidal, Military, Forensics, Currency verification, Curing, Tanning and many others.